5 megapixel dual lens camera. Apply funny effects, stamps and frames to your photos and videos. Features; 4X digital zoom, games, voice recorder and more. Take great photos and videos of you and your friends with this dual lens 5 megapixel camera by VTech! The two lenses can be swapped between at the touch of a button, making photo and video taking of any occasion effortless. Add fun effects, stamps and frames to your photos and videos, or use the auto-portrait feature to take photos automatically. Record your voice and apply funny effects to it! 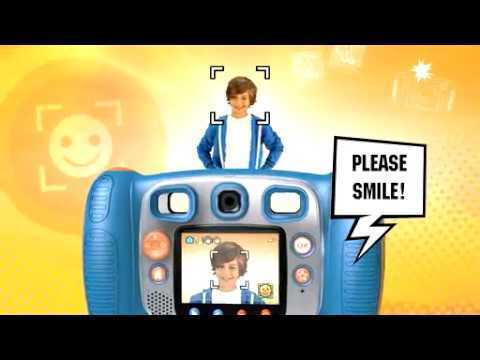 Other features include; 4X digital zoom, fun learning games, wacky photo shaker, photo editor and more. All of this is easily seen on the large 2.4" colour LCD screen. * Take high quality 5 megapixel photos and videos of you and your friends with this dual lens camera. * Switch between the two lenses with the dedicated switching button. * Apply fun effects, stamps and frames to your photos and videos. * Features include 4X digital zoom, games, voice recorder, wacky photo shaker, photo editor and more. * Include a large 2.4" colour LCD screen. * 4 x AA Batteries Required. I WOULD JUST LIKE TO THANK YOU FOR YOUR EXCELLENT SERVICE OF MY TWIN GRANDCHILDRENS TOYS FOR THERE 3RD BIRTHDAY.I LIVE IN GLASGOW SCOTLAND AND MY CHILDREN LIVE IN AUSTRALIA AND I HAVE JUST RECENTLY LEARNED HOW TO ORDER TOYS FROM YOUR SITE. I WILL BE USING IT AGAIN FOR MY OTHER GRANDCHILDREN AS THE TOYS WERE OF EXCELLENT QUALITY.